This title is nearly finished and ready for distribution. Progress is steady. I have been researching more texts for the book, and Italian artist Carlo Rapp has been visiting the villas to make his preliminary sketches. The other component of the book is the observations of those who have visited Palladio's villas over the centuries. The problem here has been that the more I read up on the subject the more visitors I find. This has led me to renew my reader's card at the Bodleian Library in Oxford and spend more time going through material new and old. I have to admit to getting a tingle sitting in the Duke Humphrey Reading Room at the top of the Old Library, turning the pages of some seventeenth-century volume. The list of visitors so far includes architects Inigo Jones and Sir Edward Lovett Pearce, Goethe, Lord Burlington, Sir Henry Wotton, Sir Charles Barry, Richard Lassels, and the sixteenth-century power-walker Thomas Coryat (of Coryat’s Crudities fame). This coming week I shall also be visiting the library of the Royal Institute of British Architects to inspect a manuscript nineteenth-century travel diary which I hope will yield some good material, and I am then booked to visit Chatsworth to see what Lord Burlington had to say. Now that things are converging, I'm planning another trip to Milan to meet Carlo Rapp to finalise layouts, and once that is done I hope I can get the text off for typesetting in Monotype Dante and order a substantial quantity of hand-made paper from Cartiera Amatruda in Amalfi. That's when it gets serious. As time has gone by, inevitably the volume of the book has increased and my PC mock-up is currently showing a 120-page book. The binding has yet to be fixed but I'm working on a number of alternatives. I have no plans for a de luxe with additional material, but I might offer alternative bindings including one in quarter vellum. Do let us know if you are interested in this book if you haven't already. We haven't fixed the edition size yet, and it always helps to get some idea of likely take-up. This was the third time we showed at the Contemporary Craft Fair at Bovey Tracey, Devon. On the previous two occasions we had good sales, certainly enough to encourage a third visit. But sales were very much down - and we were not alone - suggesting that people are reining in on discretionary spending. Handmade 2008 was held for the first time in Bath this June. Numbers were around 1,500 over the three days, which perhaps is reasonable for a brand new event, but again might be indicative of a larger economic phenomenon. However, a few good sales, both during and after the event, made all the difference and it was certainly worth our while attending. The second Oxford Guild of Printers wayzgoose proved a great success. Not only did we sell a useful amount of books but I also 'moved on' some items from the press shop that were surplus to requirements, including a nice rack of wooden furniture which, the buyer told me, would now go with her to Turkey, some small founts that I would never have used, and even a box of wooden reglet that another printer told me he generally used as kindling - OK, I actually gave that away (perhaps to someone short of kindling). One of our earliest titles was Antigone, a dark but compelling poem by Desmond Stone. As with most of our books, we made a few sets of sheets available for binders, something we do in the belief that binders should bind something new and (we like to think) worthwhile. We also encourage people to let us have photos of their bindings if they are pleased with them and a number can now be found on our website. 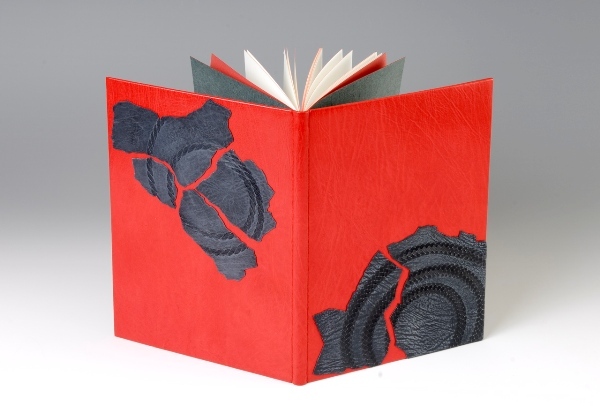 The latest - and very fine it is too - is this binding by Rachel Ward-Sale who is a fellow of Designer Bookbinders. We recently printed what is allegedly the last publication from Anthony Baker's Gruffyground Press: a printing of A E Housman's poem Tell me not Here. Copies are available at £6 each from Anthony Baker: visit his listing of available titles for details (see left).